Samsung Mobiles popularly known as Samsung Android smart phones. Because today Samsung mobile’s worldwide popularity credits not go to its marvelous designs only but its Google Android platform also. Undoubtedly we can find out that Android OS will share the major part of quality features in Samsung smart phones. We can also read the successful stories like Samsung Galaxy Series and more. Now Samsung slightly change their steps. One level it is very simple. The change comes to Samsung Mobile’s Operating System. The company changes their Android platform into Windows Mango. But the other side this ‘simple’ change may seriously affects the popularity of Samsung Mobiles. I think this is just a test dose. 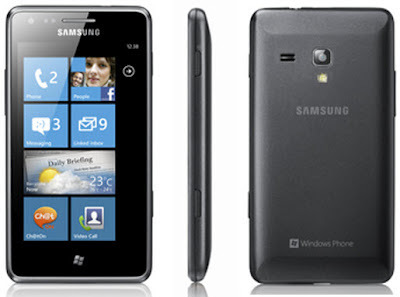 Samsung introduced their new Windows Phone 7.5 Mango OS based Smart phone named ‘Samsung Omnia M GT-S7530.’ It is an entry level Windows smartphone from Samsung. which is specially designed for compete the middle end smart phones in the present market. Samsung Omnia GT-S7530 has a brilliant 4 inch Super AMOLED TFT Touch Screen and 1 GHz processor. The device has also a 5 MP Auto focus camera with LED Flash and a VGA video calling camera. Samsung Omnia M GT-S7530 has 384MB RAM and 4GB Internal Memory (also available an 8 GB internal Memory) There is no memory card slot. That is the main drawback of the device. FM Radio with Recording (RDS), 3.5mm audio Jack etc. are the main attractions. The connectivity features include 3G HSDPA 7.2 Mbps, Wi-Fi 802.11 b/g/n, Bluetooth v 2.1, aGPS, and USB 2.0. Samsung Omnia M GT-S7530 has a powerful 1500 mAh Li-on Standard battery which provides a 760 minutes talk time. It also comes with Samsung ChatOn cross-platform communication, Tango (mVoIP) voice video calling and Xbox Live.